Diane is known for her free-spirited style. The Academy Award-winning actress of Annie Hall, The Godfather and countless other movies approaches life with vibrancy and panache and she brings this same passion to home interiors. The accomplished performer, director and producer also is a skilled designer who renovates homes for fun. Her interest in houses began early. "My design style comes from my experience. My dad would love to go to model homes, and he took me along. To me it was paradise. That was the beginning of an interest in structures and design and architecture." The actress, 72, has bought, built, redesigned and sold a variety of houses of sundry styles. Over the last 15 years, she has tackled residences from Spanish Colonial Revival to contemporary Lloyd Wright. She currently enjoys focusing on her latest project, her own home in the Sullivan Canyon area of Los Angeles. The dwelling is featured in her latest design-focused book, The House That Pinterest Built (Rizzoli, $65). The title tells it all. Keaton developed an addiction to the popular photo-sharing app while designing the expansive project. She used it throughout the construction and design process and she created the home design in collaboration with architect David Takacs and designers Stephen Shadley, Cynthia Carlson and Toben Windahl. 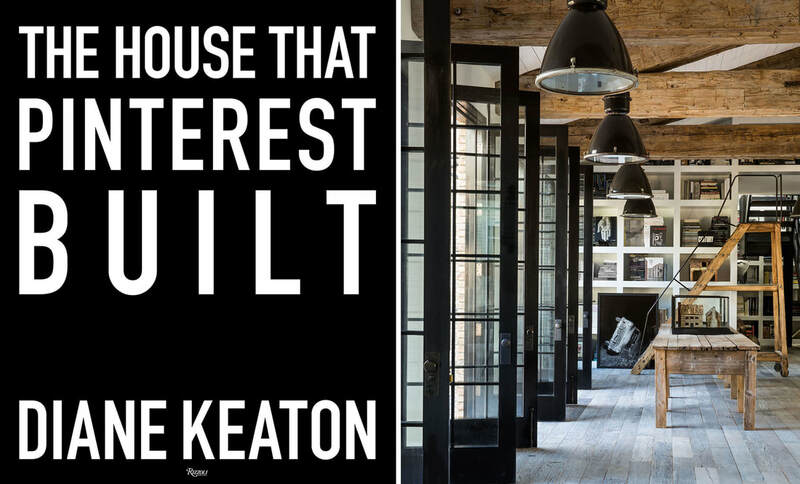 Keaton is diligent at planning her renovations and maintains hundreds of pictures and tearsheets for guidance and inspiration. Pinterest provided a fresh and exciting resource and she discovered the site through her friend and Something's Gotta Give director Nancy Meyers. Pinterest provided Keaton with the vision to realize her goal. Her book offers readers a style guide and how-to manual for imaging their own homes. Keaton's most important tip follows her personal approach. "Real life is real life," Keaton says. "You want to know what you want to do with each room. Have ideas."